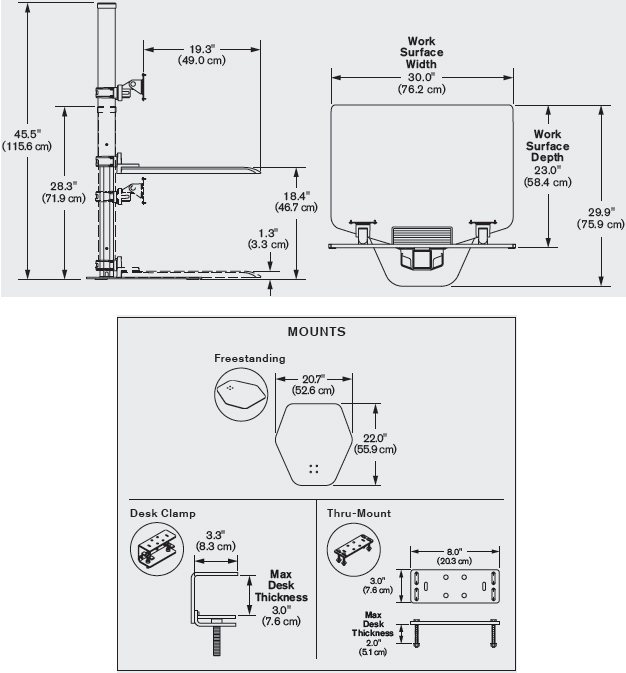 For optimal performance, select the model that will support the total weight of your monitor and all items that will be placed on the Winston work surface. This will include your keyboard and mouse. The typical weight of keyboard and mouse is between 2-4 lbs. Please note, the monitor and the worksurface move in tandem, and not independent of each other. Looking for a dual monitor workstation? Mount a 30" monitor on the Winston single monitor workstation. This adjustable monitor stand has a freestanding base which instantly turns your current desk into a standing desk. 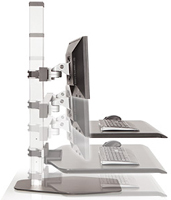 Quick installation without needing to drill makes this adjustable desktop workstation great for glass desktops. A 30" x 19.3" work surface is ideal for desks smaller than 24" deep, while accommodating keyboard, mouse, phone, documents, and other necessary work items. This adjustable workstation offers 17" of height adjust to accommodate a variety of users and give you the freedom to easily alternate between sitting and standing throughout the day. Excessive sitting is associated with a number of chronic diseases and conditions. Standing with a Winston sit-stand workstation for just three hours a day can offer the same health benefits as running 10 marathons a year and can extend your life by two years. Standing more also counters health concerns such as reducing the risk of obesity, type 2 diabetes, cardiovascular disease, and cancer. This tabletop standing desk was engineered for stability with the industry's first locking cylinder to keep your workspace in place and eliminate wobbling while you work. A sleek, professional design means the Winston workstation fits into all types of offices and businesses, from home to corporate. Convert your desk to a healthy sit-stand workstation in minutes. 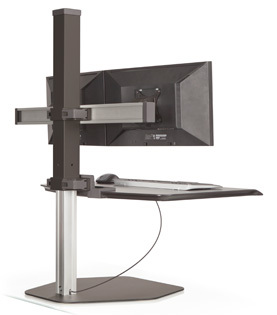 Winston Workstation freestanding sit-stand supports a flat panel monitor and features push-button height adjustment. Sit-stand workstation with compact work surface. Freestanding base retrofits to smaller desk spaces. Push-button height adjustment. Single monitor mount. Winston Workstation - Energizing your body. Inspiring your mind. Instantly converts any desk into a sit stand workspace boosting health and productivity. Recent studies have shown that sitting throughout the day can have the same negative health consequences as smoking. Winston seamlessly integrates into your workday for a boost in health and wellness. Winston Workstation now comes with a compact work surface, ideal for users with smaller spaces who want to take advantage of a healthy sit stand workstation. Attention Apple users - compatible with VESA compliant iMac’s. (Apple VESA Mount Adapter Kit not included). Question: We have an employee who has this model (single monitor), but now is getting two monitors. Can the dual monitor mounting kit be purchased to fit this model? Answer: Unfortunately single monitor unit cannot be converted to dual monitor unit due to weight reasons. The single unit is weight balanced for one monitor, adding two would cause the unit to not function.